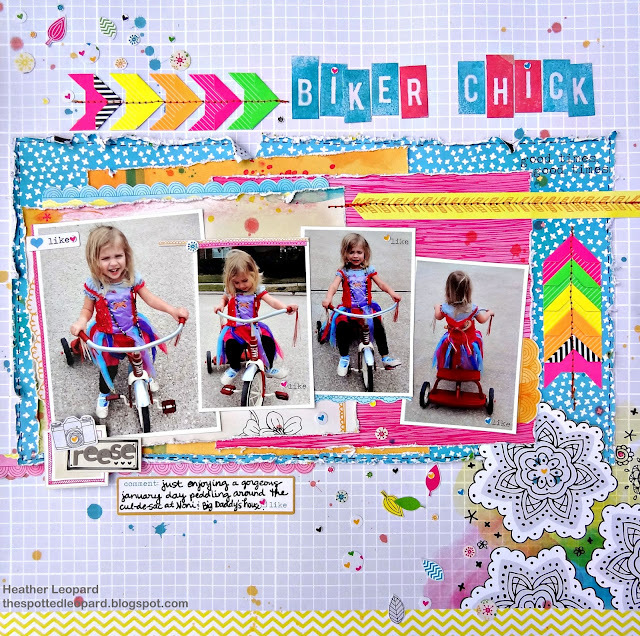 Heather Leopard: Little Biker Chick & Diana's Anniversary BLOG HOP!!! Little Biker Chick & Diana's Anniversary BLOG HOP!!! Wow, it's been blog hop central over here. I am super duper excited about this blog hop in particular. In this day in age with all the social networks, forums, challenge sites, blogs, etc. you can really meet some great people online and I consider myself fortunate to have met and developed a deep adoration for Miss Diana. Today, we're celebrating her 3 year blog-iversary by doing a blog hop with several other talented scrappy ladies, who always WOW me with their creations. And, there's something in it for you! Hop on through each of the blogs below to find prizes and inspiration along the way. Plus, there's a chance to play along with us! Use the sketch Diana made, link your entry back at her blog, and you could win a $30 shop credit to Scrapbook Circle. You have until April 30, 2012 to play along. Okay, so let's get started with the hop. If you are new to my site - WELCOME. I hope you'll like what you see and become my newest follower! If you've been here before - WELCOME BACK! 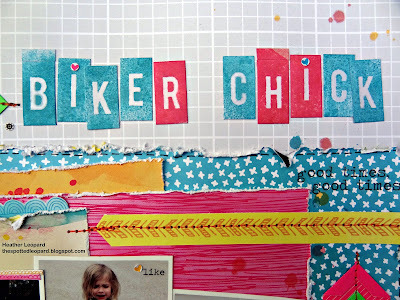 Supplies: from Scrapbook Circle April 2012 kit "Daydreamer"
Look at all the bright 80's neon that's making a comeback! Can you believe it? I misted the Heidi Swapp letters with mist and then rubbed it off. I love that you can alter the colors of these alphas! Lots of layering, distressing, and fussy cutting! Thanks for stopping by today! Good Luck! Love the brights! Cute layout and photos!! Super cute layout! I am a new follower too! How fun is this! 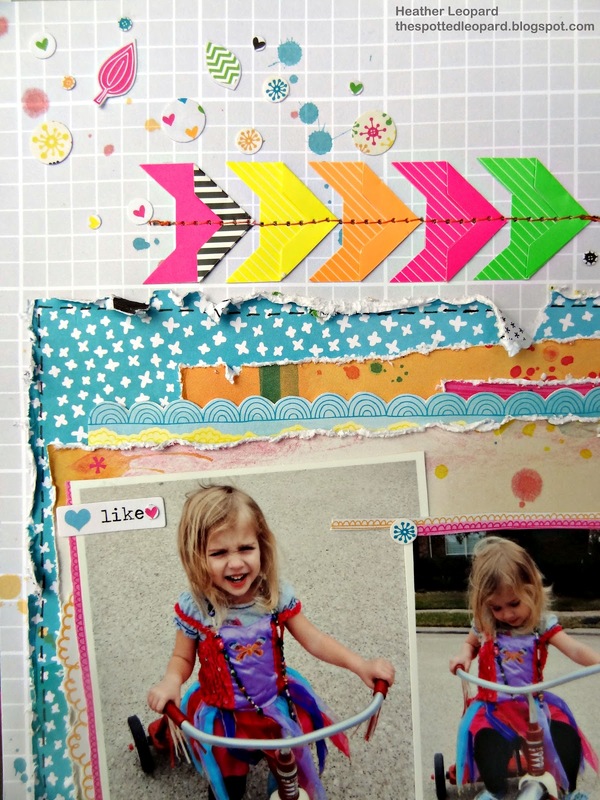 I love all the fun embellishments, the bright colors, and of course those darling photos! Your page is ca-ute! :) love the bright colors - great take on the sketch. I already follow your blog...good thing, because you're the start of the hop. Thanks for sharing, and thanks for the chance to win! Beautiful! I love how you used the photo corners for arrows! Love the bright colors! What adorable photos and great product choices. Thanks for the chance to win! I'm now a follower. Wow.i love those colors and i'm really excited they are making a come back!Your page is beautiful. WOW - I adore how you use the photo corners! Great layout Heather!! I'll admit...it's taken me a while to get used to the neaons again :) Your layout clinched it for me, love it! Love the fun, bright colors of your layout! I am now a follower. I love the bright colours of the layout..gorgeous. Wow! This layout is stunning...my favorite part is the BRIGHT colors! They pop right off the page. I am already a follower of yours, and I always enjoy seeing what you create. Look at all of this fun color! Love the sprinkled confetti and your take on the sketch, Heather! This is AWESOME Heather! I loveeeeeeeeeee the BRIGHT colors, the photos and loving that TITLE!!! This layout is bright & happy such sweet pictures too! I LOVE your layout! The bright colors are awesome and your photo corner arrows are so cool! It just cracks me up that NEON is out again . . . what goes around comes around AGAIN! Love your layout! Very fun & bright! Love the combination of Amy Tangerine and Heidi Swapp . . . two of my favorite creative ladies! Thanks for a chance to win! Heather! This is TOTALLY fantastic--LOVE how you used the photo corners and those pictures are SO cute! What a darling layout-love the bright colors and the arrows!!!!! I'm already following! Thanks for a chance to win!!!! Already a follower of course! I love this page of yours! I love that you changed the photo corners to be the arrows! Thanks for the chance! Your layout is adorable! I love all the bright, happy colors! Can't believe I wasn't already following you. Such a gorgeous page Heather!!!! I love the BRIGHT colors and fun design! I love all the bold colours! Gorgeous layout. Lovely bold and bright! This is absolutely ADORABLE! I can't wait to go to my LSS and pick up some goodies from these lines! Oh my! I love the brightness of this layout- it's right up my alley! thanks for sharing it and for the chance! I'm already a follower! Great layout! Love all those fabulous bright/bold accents. I've been on the neon fence so to speak, but this is really wonderful! What a fun layout! LOVING the bright colors and I like how you used the photo corners in your layout! Love, love, love all the bright colors and distressed layering! (and you can't go wrong with Amy Tan!) Really fun page! I love the way you moved the arrows up top. They go perfectly with your biker girl theme! Great layout! I love the colors & the photos! I love the colors and the texture in this layout! I especially love how you used the photo corners! Awesome page! The vibrant colors and all the techniques make those adorable photos pop! Thanks for the chance to win! Wow.........love all the bright colors in your LO! I love all those random small pieces scattered throughout your LO! What a bright and cheerful layout! Love it! Added you to my Google Reader! Thanks for the chance to win! I love your layout!! I really love how you used the photo corners. Love your LO. I'm a bright color person too. I love the vibrant colors in your layout. What fun! LOVE your blog and your projects !!!!! Totally love your page from the sketch ...and I pinned your page...love it!!! Love the colors, so fun! wow!!! This is so beautiful, happy and bright!!! I love all of the shapes on there with the arrows to the flowers!!! Just stunning! Thanks so much! Heather, this is just awesome!!! The colors! WOW! Fabulous! I love the bright colors on your layout--it's so pretty! the colors and fun shapes are great! 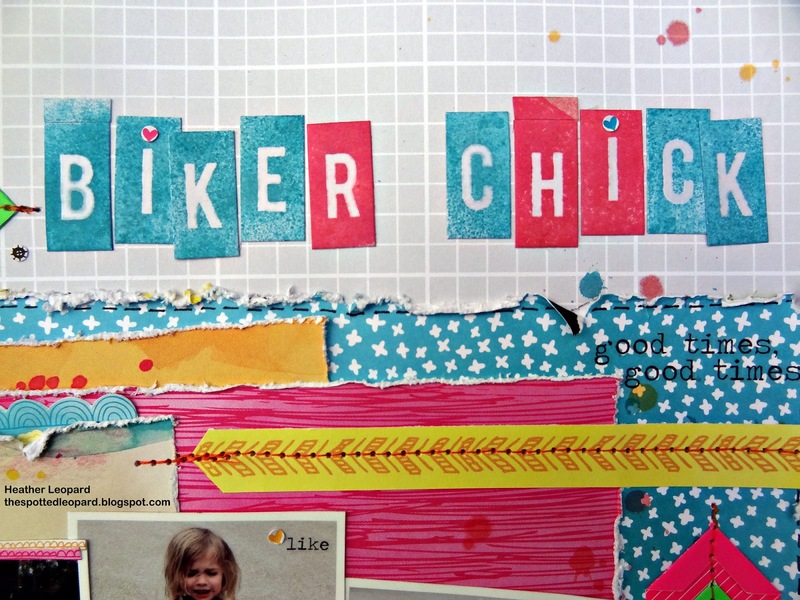 I love the bright colors, photo corners as arrows, and the fun title. Super cute layout! I lve how ou used the photo corners! SUCH a clever idea...and the photos are precious! I am inspired! Wow, that is an awesome LO! Love the bright colors and all the rough edges! fabulous fun colour take on the sketch.. I did become a follower. I like your work & the DTs you're on. 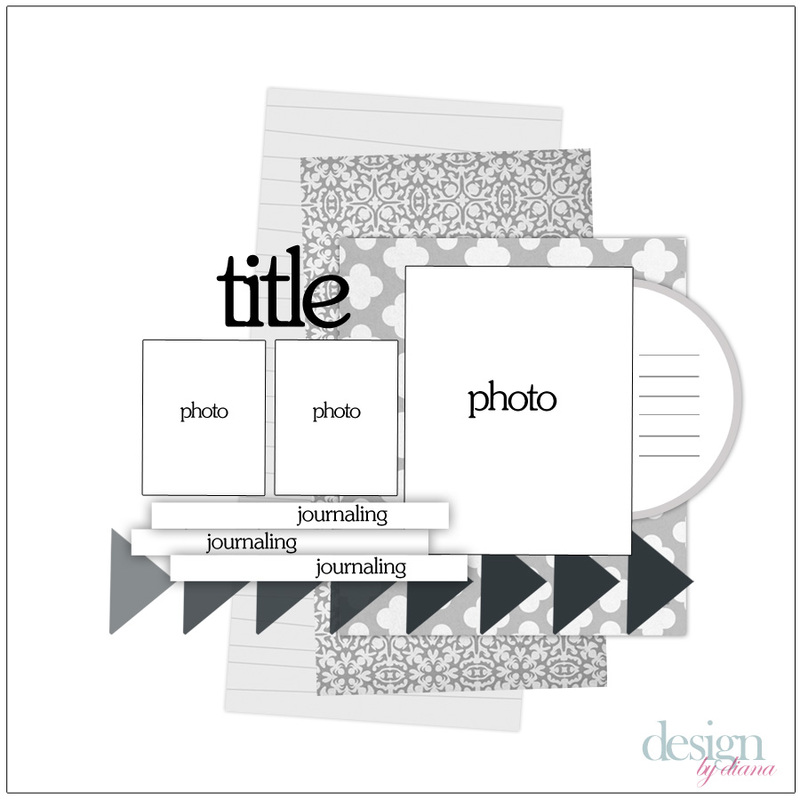 Love your distressing , title and layering on your layout. Thanks a million for this giveaway opportunity. I am now a follower of your blog. 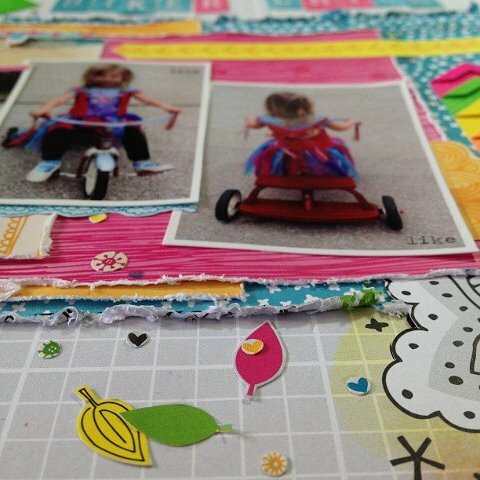 I absolutely love your bright colors, your layering, and your sense of movement on this layout - fabulous work! What a gorgeous and fun page! Came up on this via Pinterest, happy to have found your blog! We Have Our Winners! Is Your Name Below? Blog Hops, Classes and CHEVRONS! Oh MY!